Phew! You guys, I FINALLY got my daughter’s big girl bedroom finished and photographed. Well mostly finished, I still want to put a rug in here, but I can’t find one I like yet, and I couldn’t wait any longer to share. So you remember this room makeover all started with my obsession with this wallpaper…. and then my “Fancy Nancy” loving girl decided she needed a “princess canopy” to go with all those flowers. Tutorial coming soon. And what self respecting 6 year old, soon to be 1st grader, doesn’t have a homework desk in their room? You can check out all the details here on how I turned a $10 old school desk into her glammed up crafting space. 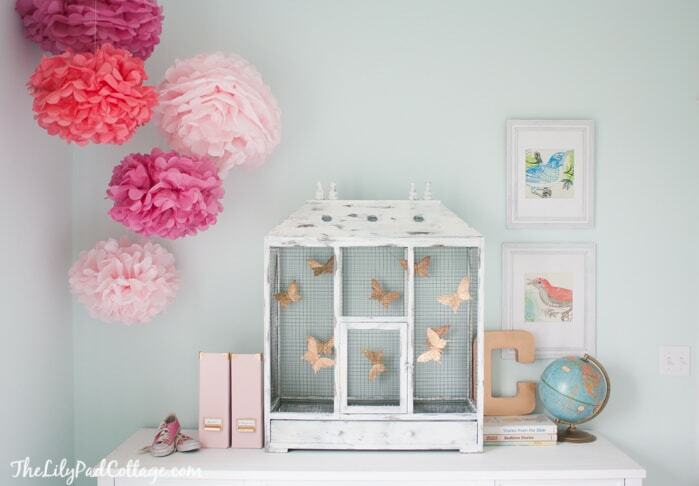 She did however agree that every girl should have a birdcage filled with gold flying butterflies in her room. 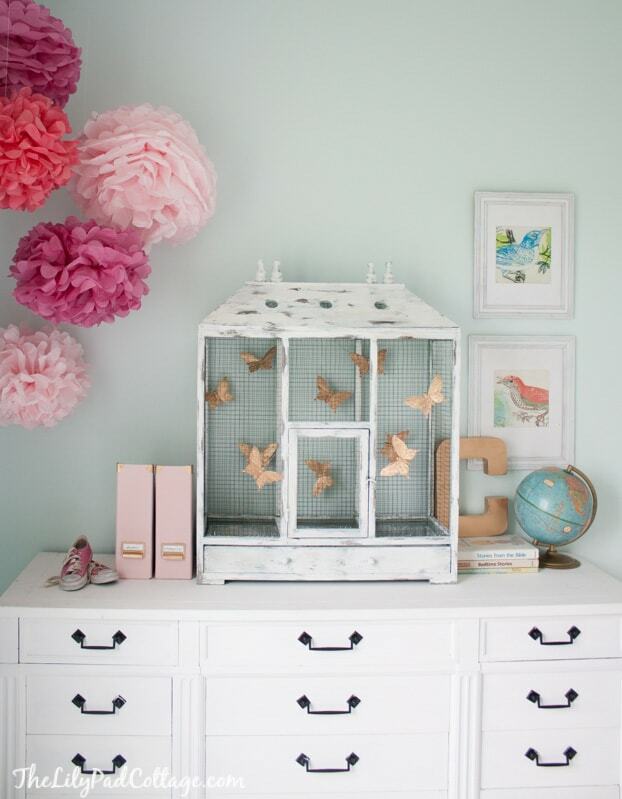 This is the birdcage that used to be in my living room, it didn’t work in there anymore with the new paint color (that I have still yet to show you) so I painted it white and love it in here instead. I found the butterflies 1/2 off after Easter at Michaels. They were these neon glitterfied things that I’m sure my girlie would have loved, but I spray painted them gold before she got the chance to see them. My girlie has a zillion kids magazines and paperback easy readers, so I picked up these organizers at Ikea (same trip I picked up my tarva hack dressers). They were green and silver and didn’t really work in here, so again I hit them with some spray paint. She is still attached to her pink tissue paper pom poms from her 3rd birthday party so those stayed put. What happened to my little pre-school baby? 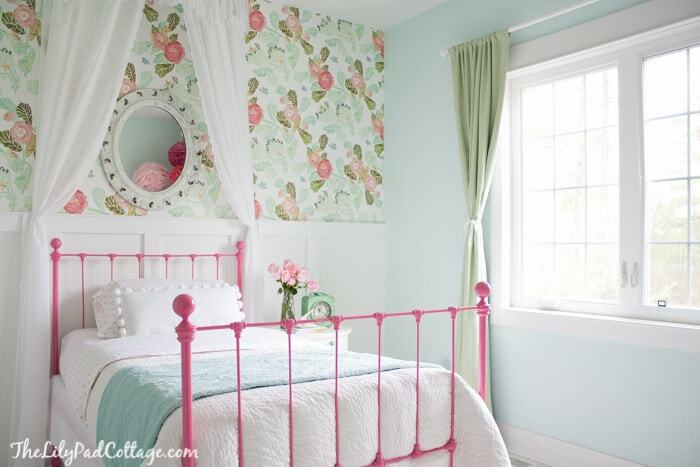 What an adorable little girl room! Absolutely love that wallpaper, but I think my favorite part may be those gold butterflies. So great! Such a beautiful room! You did an amazing job. I absolutely love that birdcage. Thanks Rebecca! Me too, it was hard to part with in the living room but I love it in here. Hey Tara, I think you mean Joss and Main? But yes you saw me over there :) Thanks for your sweet comments! Yes…. That’s it. It was Joss and Main! Very nice! It is so gorgeous…I’d sleep in there!! Love the color choices. Oh Kelly! I never thought her old room could be topped it was so perfect, but this room… Is stunningly beautiful! The wallpaper is gorgeous with the white floors and all the little details like the gold butterflies, so perfect. The whole space is so sophisticated, and very “fancy nancy.” You did amazing. And she’s growing up way to fast!! What a huge difference 18 months makes I can’t even believe that! Love it, Kelly! Beautiful and so airy! It turned out amazing! LOVE that wall paper. Just adorable. Love everything. You did an amazing job. Love it all. I am not a walpaper person but it looks great. After many years of having wallpaper I am done with wallpaper ! I really loved her old room !!!! Thanks for pinning Amber! So far the canopy had stayed put, crossing my fingers! What a sweet little girl room. In will share with my DIL I know our little Bella , soon to be 6 will simply luv it. Thanks for sharing. Thanks Gee, love the name Bella! It is beautiful and 2 of my favorite colors together. It would be so cute too if you made a cushion for the chair at her desk or if you could find a wooden chair and make a cushion with flowers that compliment the wallpaper.. I think it would tie everything in so well. There, I put in my 2 cents and no one even asked for it.. lol.. Its just beautiful though. 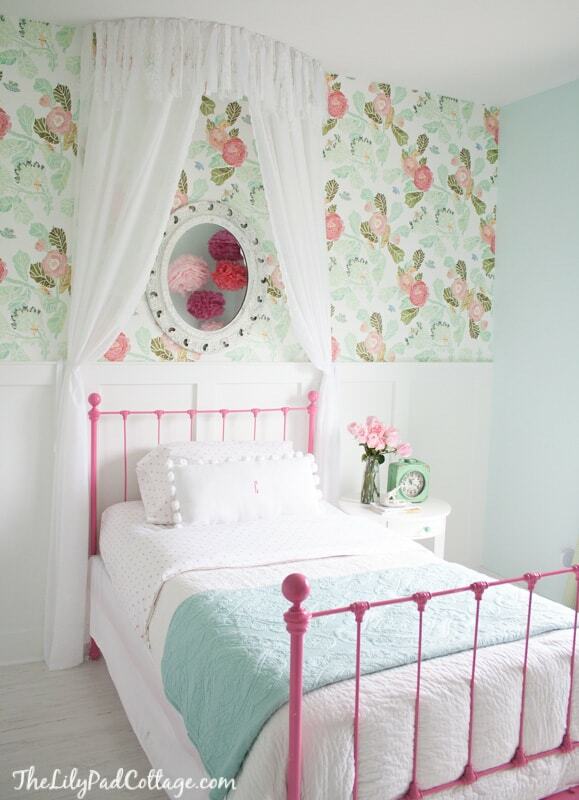 oh my word, this is the sweetest room, I love that wall covering, so beautiful, just like her! Thank you Virginia, it suits her. LOVE!! That wallpaper is fabulous!! You always do such a great job Kelly!! Oh what a beautiful room! That wallpaper was the perfect starting point. Love the bed and the charming bircage. And of course your daughter is so sweet! I have to say I’m a little sad because her room is how I found you. :) But I love the birdcage, and my girl needs that canopy! Oh it so, so pretty, Kelly! I am dying over the two pics of her too – I feel like my girls are growing up SO FAST too!! Love this!! 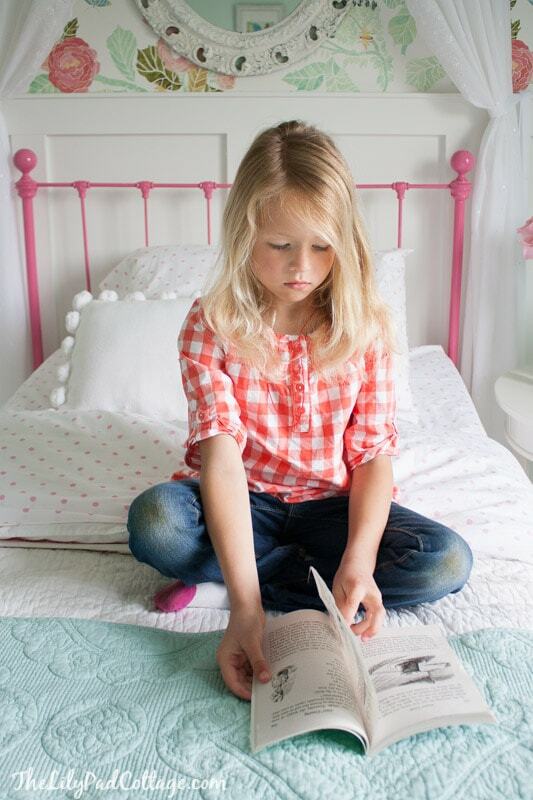 I would have loved to have a room like this when I was her age – well done! I love the room and you did a fantastic job. Your little princess is adorable — she looks like you. My gosh, where do you go from here if she wants her room redone? :-( I would hate to touch anything. WOW! Love the wall paper! Where did you get it? and what paint color did you use? Love the softness of it! The birdcage is super! Great job! She is one Lucky little lady!! Hi Janet it’s from Anthropologie. My favorite thing about all of these photos are the grass stains on her jeans. I want to be her friend. So pretty, Kelly, I think it’s one of the prettiest rooms I’ve seen. Love the canopy, the birdcage and butterflies, I would not of thought of painting them gold, and the pink bed really pops. You should be doing this for a living! Best part is you can just change out the accessories as she grows and this room can take her through college. She’s going to have lots of great memories growing up in that room. I almost forgot, I don’t rmember noticing the floor in previous posts, it’s great! Thanks Becky, yeah both kids have the white washed looking laminate in their rooms, so easy to clean up! Such an amazing job – the new butterfly cage is just fantastic! This is stunning!!! What a lucky, lucky girl to have SUCH a beautiful room to call her own!!! I am SO excited to share this with my Favorite Finds this week! Wishing you a lovely weekend! Thanks so much for sharing Kristi! Your little Diva is one lucky little lady. This room is AMAZING!!! I love every change. So beautiful Kelly. It looks fantastic. And boy your Girl has grown up so much. That’s what happens…they keep growing and growing and then they are young ladies and young men. Happens soo fast too. Just wait until middle school…they start 6th grade looking still like a young girl/boy. Then 8th grade …something happens! A young lady and young man comes out! It’s incredible. Enjoy every moment….you are an great mom! I think a child having a beautiful room helps her learn how to have a beautiful, organized home when she has her own home. My daughter has turned college apartments into pretty homes and some rental properties into a comfortable place and now a custom build home into something very special. It makes her husband very happy. Such a lovely room! You really did an amazing job and potty training to boot. Your daughter is just beautiful!! SO so beautiful Kelly!! I am in awe. AGAIN! Just love everything about it! thanks girl! Obsessed with how your house is coming together! 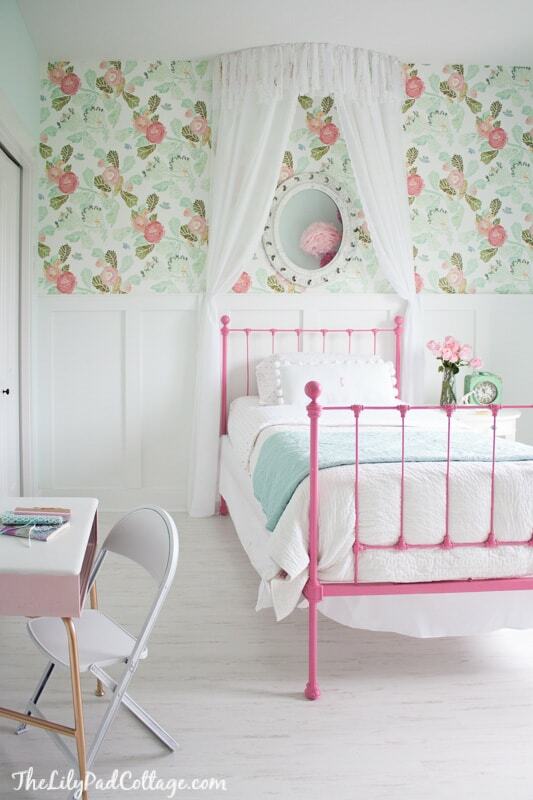 What an adorable room for your adorable daughter! Simply stunning! I’m 32 and I’d totally love this as my room!! I can’t even pic a favorite part. Amazing job! The old room was seriously a show stopper but you have done it again! That wallpaper is absolutely gorgeous! 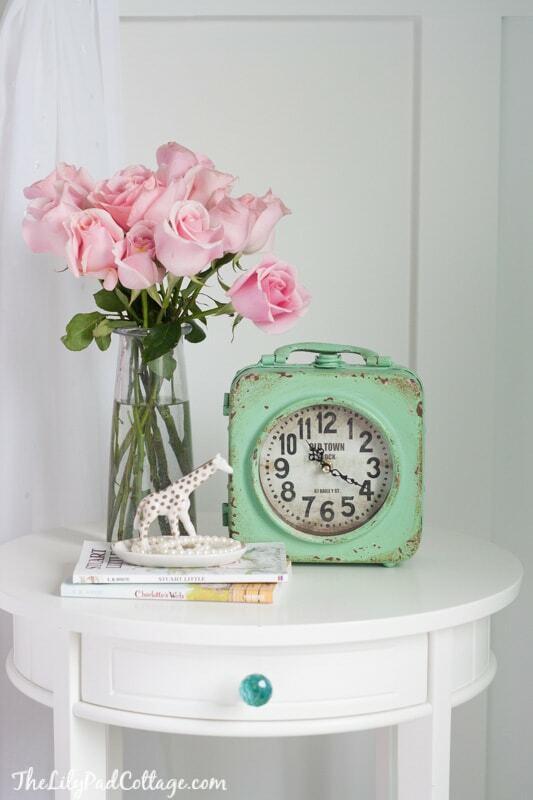 And love the clock with the dirt on it! Thanks Jen, glad someone appreciates my rusty old clock! You are SO talented! I absolutely love the room – wish I had this sweet set up when I was a young girl! Thanks so much for the pins girl! Ohmygosh sad!! Where does time go? I love the updated shots of her reading. Her room is GORGEOUS, Kelly!!! So beautiful! Thanks! I know ack, can’t believe how old she is getting it! So cute!!! Where did you find the blue quilt? It was $15 at HomeGoods! ugh still plugging along at the potty training, thanks sweet friend! OH MY GOSH!!!!! It turned out so gorgeous!! 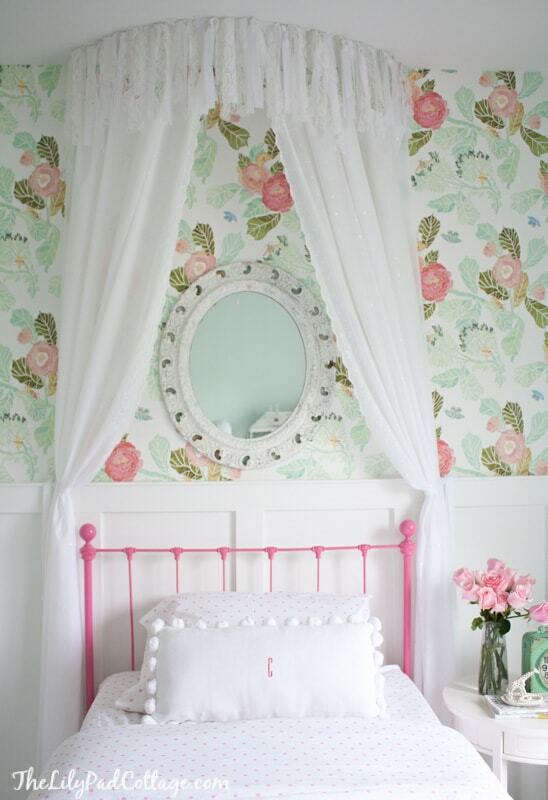 That wallpaper is perfect and I’m obsessed with the little canopy! I’m working on the tutorial now! I’m dying! This room is gorgeous! I’d love this as my room now! You did an amazing job, and that wallpaper! Thanks for linking up and sharing this nugget of gold! Pinned it! Ohhh! The wallpaper, I have a serious crush! But couldn´t find it in the online shop? I really need it, I ca feel it calling my name:-) How long ago did you buy it? I love this room! What paint colors did you use? Hi! I just saw this incredible bedroom that was featured on the link party palooza. I was just floored! I poked around your blog for the last hour and I can honestly say that EVERYTHING you have done is right in line with my style, lol….Love it all. I think I found my new favorite blog, and I’m now following you on all of the ways I can follow. So glad to have found your blog! Such a lovely room! I adore everything! Do you mind my asking where you got your white bedding? Hey Melody it’s just some old bedding I already had in the closet. The sheets are from Land of Nod. This is beautiful! What paint color did you use on the walls? Sorry if this is listed on post. But, the bed is a slice of heaven? Where can I find it? Simpy stunning room! Hi Rebekah, I found it at a vintage store for $100 and then I spray painted it bright pink. Try Craigslist maybe? Kelly, I might of miss it somewhere in your blog, but is your daughter room floor painted or does it have carpet? Can tell in the pictures. Hi Kathleen, it is actually a white washed laminate floor. Cleans up easy (even crayon ha) and I love how neutral it is so the bright colors in there really pop. My son has the same floors in his room as well. Love! Love!!!!!!! This room is so cute! I love the bird cage!!! 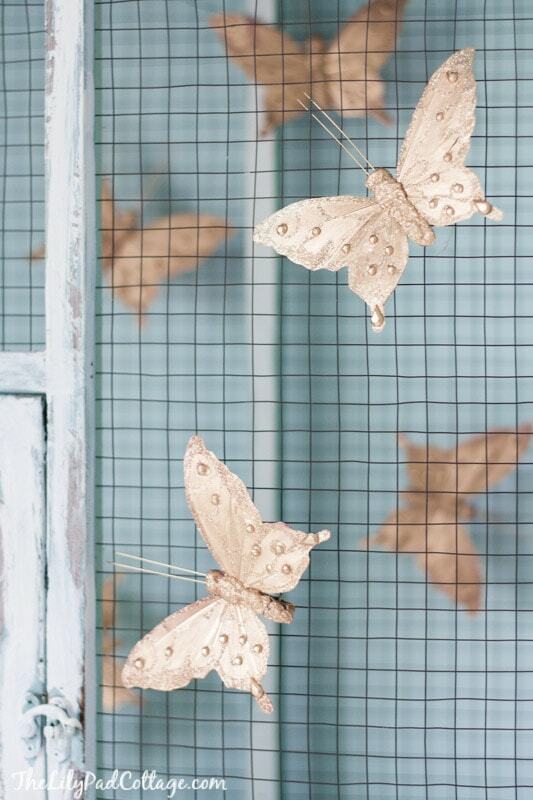 What did you use to stick the butterflies on the bird cage? I would love to know where you got her bedding from. I am in the market for some for my daughter. Hi! This is a beautiful room. I apologize if someone already asked this, but… where did you find all your bedding components? I know you got the blue quilt from home goods, but how about the rest of it? Thanks in advance! Love the room, so cute!! Where did you get the bed? I have been looking one for my little girl and it’s adorable! So so so pretty. Would you mind sharing the new pink color for the bed frame? Thanks! I think it’s Frostberry by Valspar? I painted it a few years ago now, but it’s definitely the darkest pink that Lowe’s carries. Are you looking for the bedding you mean? Lovely! You did such an amazing job :) What brand/color spray paint did you use on the magazine holders? 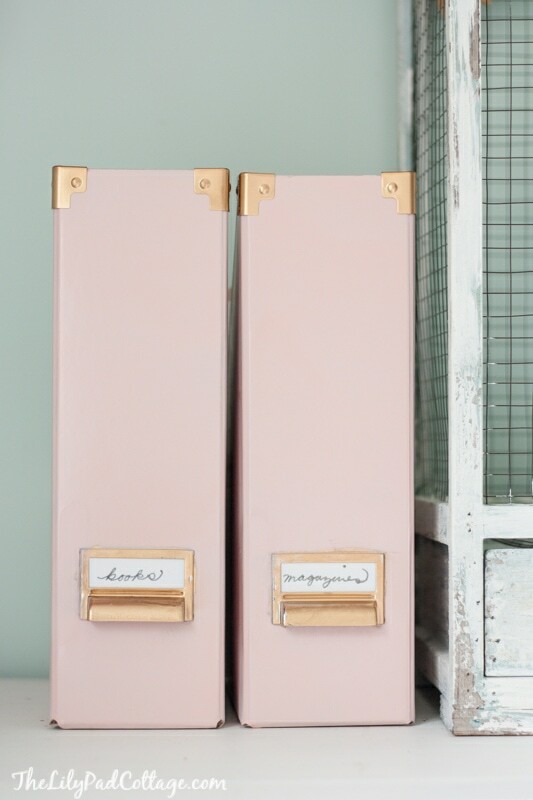 I’ve been looking for ways to add just a little pale pink to my decor. oh, I want to say it’s called Ballet slipper? Your kids are so lucky to have a mom like you! I love the butterfly bird cage so much I want it for me. What spray paint did you use for the magazine racks!? and what color! Oh it was called Ballet Slipper, I can’t think of what brand! Google it maybe? 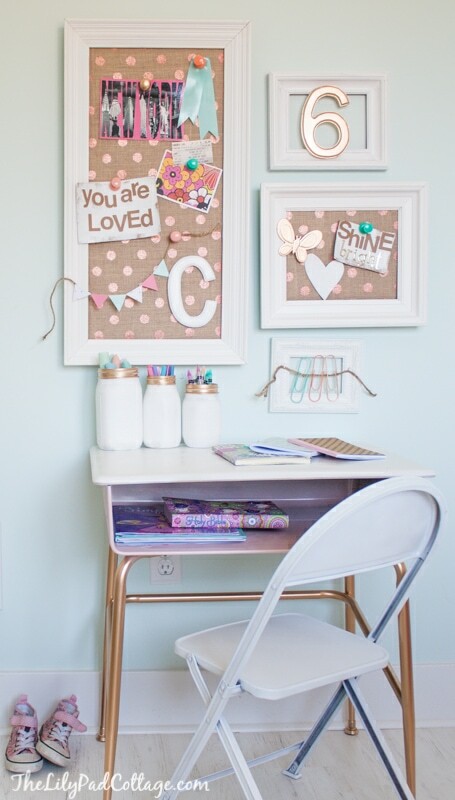 Question for you, did you make the magnetic boards? If so how did you do the burlb? 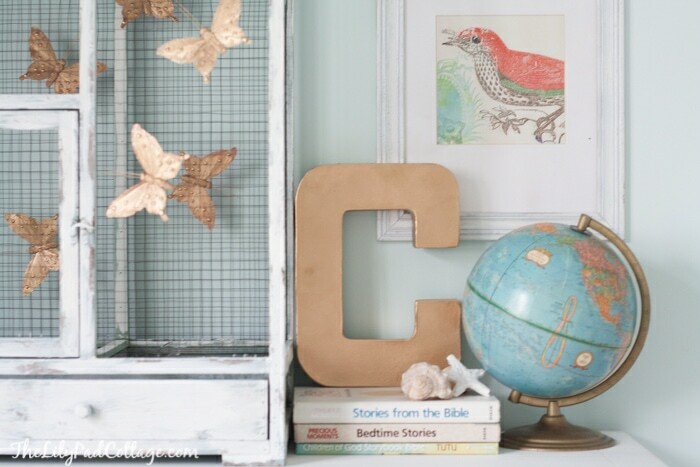 Love your blog and this room!! I bought the same wallpaper for my baby girls nursery and i can not find the perfect green for her walls! i stumbled across your blog and your color Touch Of Green by para paints is PERFECT! I’ve tried Lowes and emailing Para Paints themselves but no response. Do you have any other color suggestions that are similar? I can’t even find this color in the US to color match! Her room looks gorgeous! ugh I know Erin, I have lots of people who have asked me this! I have no idea why this is the only info I have on the paint :( I need to get this figured out! Blanket at Lowes was pretty close but a little more bright…maybe try that at 80 percent? Sorry! Wow, what a lovely room. Sorry but I can’t help but also noticed how smart your girl is. She’s reading that chapter-looking book already at 6?! And the great sense of decoration already! You must be a proud mom. So I have a three year old who is getting “kicked” out of her toddler bed because she has a little brother arriving shortly. I have been looking everywhere for the bedding that was on your daughters 5 year old bed. I know it is PB Teen, but do you know the name of the print. Much appreciated! It’s the Swirly Paisley duvet cover from PB Teen thanks! Hi Kelly they are just hung up there with very thin string and pushpins! How much of the wallpaper did you use in your daughters room. I love this room! 1 roll but I really needed two, it was a close call! I’m sorry if I missed this looking through the comments, but did you list the source for the quilts on her bed? They are beautiful! The whole room is stunning and such an inspiration for me as I work on a shared big-girl room for my 6- and 2-year-olds. Thank you! Hi Christie, the white quilt on the bed was a hand me down and the teal one I found at HomeGoods a few years back. Thanks! I adore your style! I am using your room as inspiration as I do my girls room. Could you share where you got the bird prints above her dresser? My daughter loves birds and I have been searching forever trying to find some cute 8×10 prints. Hey Heather, I think they are from World Market but it was several years back. Thanks! Hi Tracey, ah the changing opinions of daughters ha :) Good luck with your makeover! Love both of your rooms. How did you spray paint the ikea boxes with the metal parts gold? Were you able to take those off? I love your little girls room! Can you tell me the size of the frames above the desk? Hi! 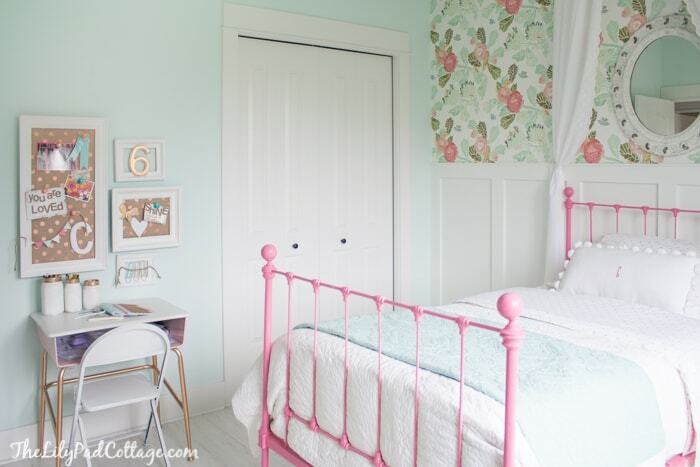 I’m wondering where the pink iron bed frame is from, as well as the wallpaper? 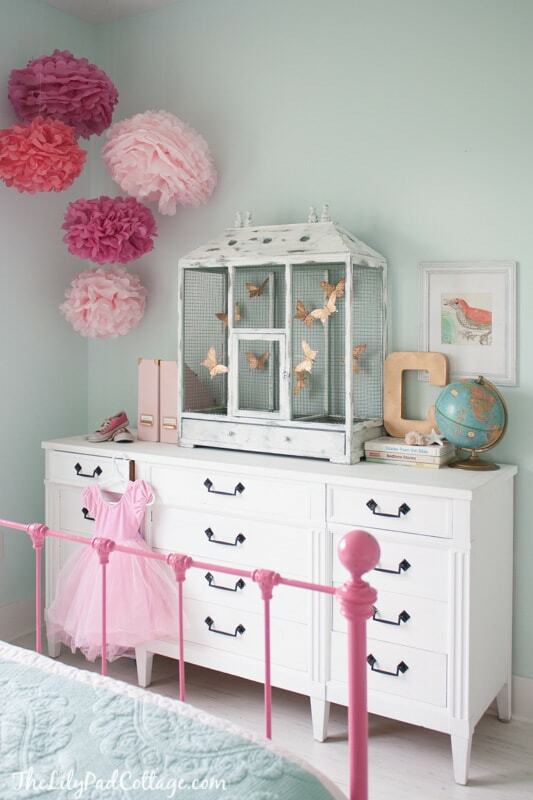 I love both and and looking to re-create the same look for my little girl’s room at our lakehouse. I bought it at a vintage store and spray painted it, and the wallpaper is from anthropologie thanks! Such an adorable room! I’d love to know what color green/blue you used to paint on the walls. It matches perfectly! Do you happen to remember what spray you used on her bed? Thanks! I don’t sorry Ashley, this post is a few years old! Oh my goodness, we must be soul sisters. My cousin has a pom pom bedspread she bought years ago at Pottery Barn, I can’t find it anymore online (Its different than the teen version) so I thought I would try to make it and found your blog! 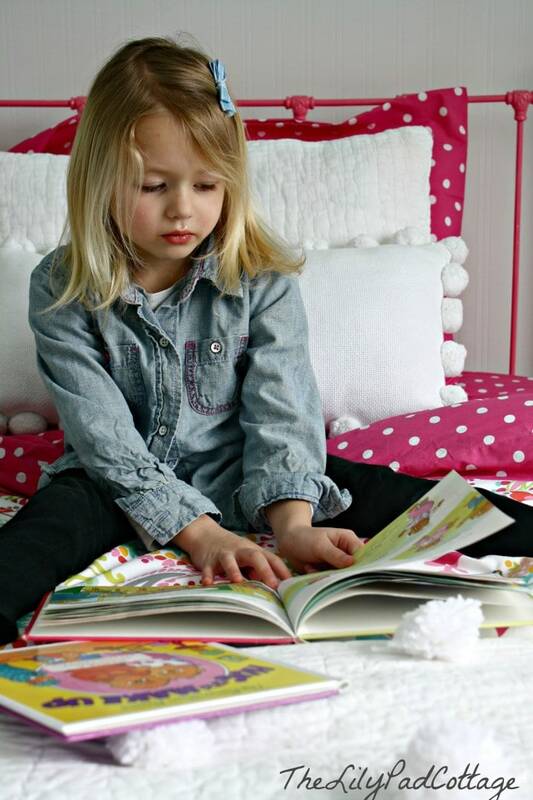 I was just scrolling through this admiring the cuteness of your little ones room and noticed the two books on her desk. Not kidding you, today was the last day of school so I thought I would run to the library for some new books my 7 year old to read over the first couple of weeks of summer. I scavenged the shelves for 30 minutes and finally decided on two. Which ones were they? Stuart Little and Charlottes Web! I just thought that was funny. Her room is adorable. What is the white quilt? Is it just the back of a regular quilt or did you buy it? One last thing, sorry. I know this is annoying. I chose those books over other classics as I was trying to stay away from all the hoodoo voodoo magic, witches and supernatural books that I feel like so many literary classics are. I was looking for some cute classics that a Christian could read and chose those. I noticed your bible books and I am assuming our girls are similar in age. Any recommendations on literature she loves? Hi Danielle, this post is a few years old so she is reading different books now. She did read all the Narnia books and loved them. It’s just an old white quilt from my grandmother. Thanks! Oh… and growing up, I slept in a bed that was EXACTLY the same as that, except my mom had it painted turquoise. We still have it! Very pretty! My daughter turned six and still plays with toys and prefers her dolls and doll houses etc…to be around her. It’s a very precocious room, I will file this for when my child turns 8-10. Meanwhile, will enjoy the toys and whimsy a lil longer. I’m just about to reveal her new room at our new house next week :) thanks!